Apply liberally and evenly before sun exposure. See product package for detailed usage instructions. Active ingredients: Titanium Dioxide 2.5%, Zinc Oxide 3.9%. Inactive ingredients: Cyclopentasiloxane, Dimethicone Crosspolymer, Ethylhexyl Hydroxystearate Benzoate, Glycerin, Dimethicone/Vinyl Dimethicone Crosspolymer, Water/Aqua/Eau, Cyclotetrasiloxane, Dimethiconol, Tocopheryl Acetate, Simmondsia Chinensis (Jojoba) Seed Oil, Dimethicone, Stearic Acid, Citrus Paradisi (Grapefruit) Seed Extract, Butylene Glycol, Cyclohexasiloxane, Spirulina Maxima Extract, Melaleuca Alternifolia (Tea Tree) Leaf Oil, Lavandula Angustifolia (Lavender) Oil, Citrus Reticulata (Tangerine) Peel Oil, Avena Sativa (Oat) Kernel Protein, Melissa Officinalis Leaf Powder, Aloe Barbadensis Leaf Extract, Glycine Soja (Soybean) Oil, Palmeria Palmata Extract, Camellia Sinensis Leaf Extract, Beta-Glucan, Avena Sativa (Oat) Kernel Extract, Triethoxycaprylylsilane, Ascorbic Acid, Aluminum Hydroxide, Propyl Gallate, Tyrosine, Glucose, BHT, Phenoxyethanol, Limonene, Linalool, Beta Carotene (CI 40800). Honestly this is one of my all-time favorite products. I can throw it in any bag without worrying about leakage. But, most importantly, with this I reapply SPF every couple of hours over makeup - not something everyone does. My sister-in-law had a beach wedding in the morning with beach reception all afternoon. I was the only member of the wedding who didn't end up with a massive burn. 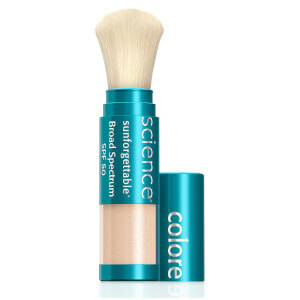 Additionally, I love that they made a powdered sunscreen that suits my super-fair skin! Most end up making me look over-bronzed or orange. The best sunscreen Ive ever used. I have pale, extremely oily/acne prone skin, it protects and even helps hide the blemishes and redness on my face without leaving a shiny, greasy and slick look on my face which all liquid sunscreens do. Love the handy brush dispenser, just brush on and your done. I even use it to set my mineral makeup for daytime. The only downside is its very expensive for a sunscreen and I also wish it didnt have Dimethicone and bismuth in it as it can sometimes cause my face to get more irriated if Im expirencing a dermatitis outbreak. We are a full time outdoor sports family.From ski races to swim meets, this block works wonders. It is the only block that my huge football star sons will tolerate. My freestyle skiers don't worry about the block getting crushed and leaking into their pockets.I like the fact that it doesn't bother my eyes during tennis matches, and I don't have to wash my hands after applying. One powder tube outlasts several bottles of lotion sunblock. From sea level to 14,000 feet, this veteran sports mom swears by it! I was curious about this product, having tried Jane Iredale's version. I couldn't find the exact color for me in the latter, so I thought I'd give this a try in the trial size. I spend a lot of money maintaining that"glow" we all want, and even when I applied this ever so lightly and blended it with a brush or puff, I looked pasty and dry. Also, if you do apply it lightly, are you getting all the much needed sun protection? Glad I tried the trial size, and glad I tried it in the winter. I am sticking with my all time favorite - SkinCeuticals UV Defense 20. A little dab of that rubbed between the palms and pressed onto the face. I haven't had a sunburn in years with that, plus the skin looks and feels good while wearing it. 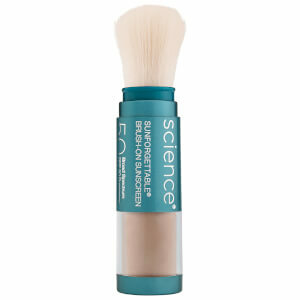 This product will be great if you like mineral foundation and such. The powder is really fine and goes on smoothly. Bare Escentuals doesn't make any SPF30 and Peter Thomas Clear SPF is not as fine. LOVE IT! Didn't deserve my 5 stars because of the price. This is the only suncreen I've ever bought and KEPT using - because it doesn't irritate, clog, dry, or interfere with other products. I recommend it to everyone. it's dries out my skin and makes me look dull & flaky. hard to use: can't tell if i'm using enough, when i dispense more it creates a dust cloud which i've accidentally inhaled before (had my mouth slightly open i guess. ), i'm going back to traditional liquid sunblock. Very transperant for a product that has such a high amount of zinic and titanium dioxide. It does offer very good protection, but it's so drying and I don't have dry skin. Very hard to wash off at night. SkinCeuticals Ultimate UV Defense is a far superior product. However, if you plan on spending a lot of time in the water this is the best sunscreen on the market.